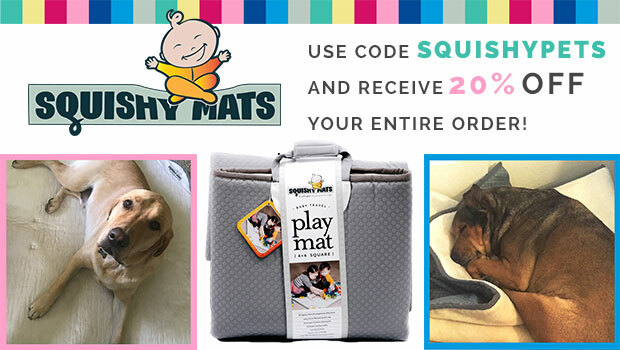 Squishy Mats Review by Cynthia Shannon | 20% Off Squishy Mats - Great for Babies & Pets! My pup, Riley, is such a little diva of a man-pup. Whenever we take him places where we plan to stick around for awhile, like a coffee shop or our favorite brewery, he spends the whole time fidgeting. He refuses to lay his delicate elbows and belly on the cold, hard ground. He is much too used to having his soft, cushiony pup-bed. He's got 4 throughout our house (not that he's spoiled or anything...). But they're too darn big to travel with. So when I found out about Squishy Mats, I was psyched! Squishy Mats contain almost one inch of Memory Foam - also known as the low resistance polyurethane foam developed by NASA in the 1960s. The surface of each mat is covered by a super soft, micro-flannel fabric and is backed with a nonslip rubber grid. Each mat is durable, sturdy and designed for life on the move. The perfect solution for our diva pup! My husband and I can enjoy our delicious, frosty beers while Riley can sleep comfortably on his Squishy Mat. The Squishy Mat would also be perfect for infants or toddlers - a great way to keep them comfortable and off the dirty ground. 16" x 32" The Skinny Mini - perfect for little dogs with big personalities and a nice way to protect "their" spot on the couch from hair - folds and fastens with a carrying handle. 3' x 3' Little Squishy - The Little Squishy fits perfectly in the back of most vehicles, keeping your automobile clean and your fur babies comfortable - folds and fastens with a carrying handle. 4' x 4' Big Squishy - Let's face it, the dog is just gonna steal the Squishy Mat from you and your little one. The Big Squishy is truly made with everyone in mind, but buy Fluffy his own mat and be sure to pick one up for yourself - folds and fastens with a carrying handle. I'm so grateful that I was sent a complimentary Squishy Mat to check out. I'm hooked! Want your own Squishy Mat? My readers save 20% Off with code SQUISHYPETS on all sized Squishy Mats - Because Squishy Mats are for EVERYONE!